It was 1968, and Terry Gosliner and Gary Williams were late for high school graduation practice. That day was one of the lowest Bay Area tides in decades and the tide pools of Duxbury Reef in Bolinas were calling. While exploring among the rocks, the boys came across a soft little sea slug they’d never seen before—pale yellow and looking a bit like a poached egg. 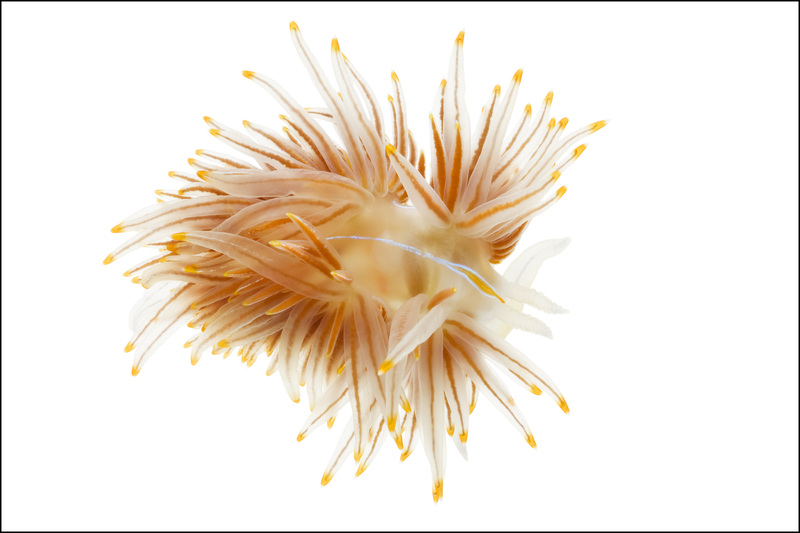 Since he was a kid, Gosliner had been poring over books on nudibranchs, and had even been published on the subject. He had a feeling this species was new to science. In a testament to his already prodigious understanding of sea slug taxonomy, it turned out he was right. Forty years later, his mind holds one of the world’s foremost nudibranch identification keys. As it turned out, Gosliner discovered that these creatures he has such deep affection for are also extremely useful to science. Here’s why: Nudibranchs have evolved to rely on a wide range of prey, from corals and hydras to anemones and sea squirts. So scientists can use their distribution and diversity as an indicator of reef and ecosystem health. Where there are lots of different kinds of nudibranchs, there are lots of different kinds of prey, signifying a healthy ecosystem. 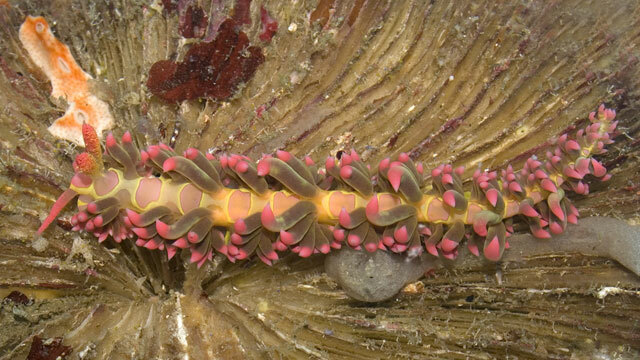 The very first paper Gosliner published in high school documented a nudibranch found outside its range—a small ecosystem shift signifying something larger. That's what happened years later, during the 2015 El Nino, when he discovered the sudden influx of the Hopkins Rose sea slug from Southern California into Bay Area waters. It was an alarm bell about changing ocean conditions. 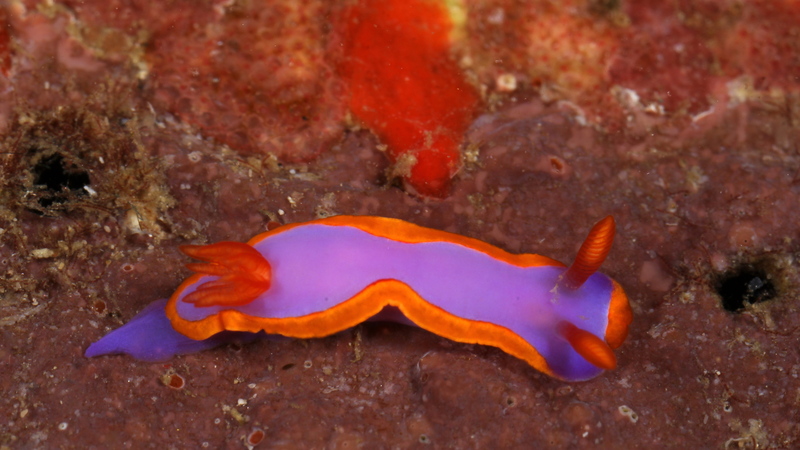 You don’t have to go all the way to the South Pacific to find these colorful sea slugs. Look for lower-than-average tides, go out just before low tide and look in deep tide pools that have little wave action. 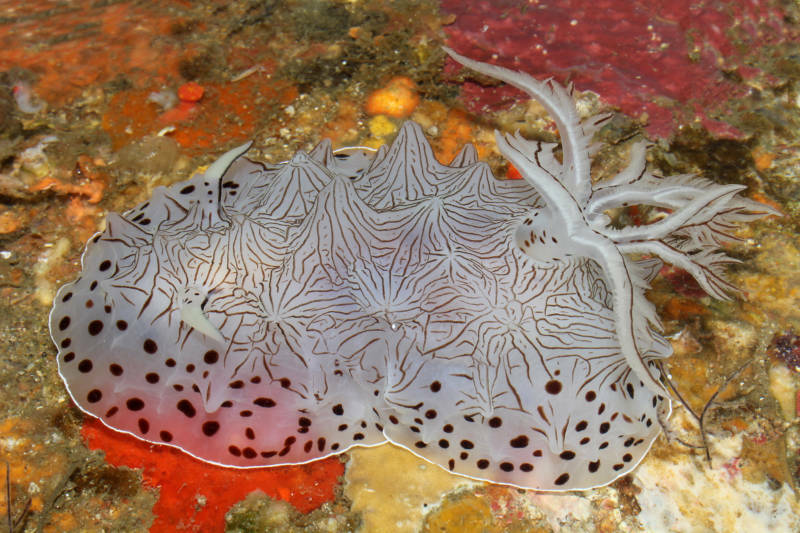 You can find nudibranchs crawling on the bottom of pools. Duxbury Reef in Bolinas is Gosliner’s favorite spot. It’s where he saw his first nudibranch and where he discovered his first species. At Fitzgerald Marine Reserve in Moss Beach, tidepools are easily accessed from a nearby parking lot. Another favorite tidepool destination is Pillar Point near Half Moon Bay. Gosliner, who went on to get his doctorate in zoology, is now a senior curator at the California Academy of Sciences. And his office is right next to that of none other than his tidepooling buddy, Gary Williams, a biologist who specializes in corals. 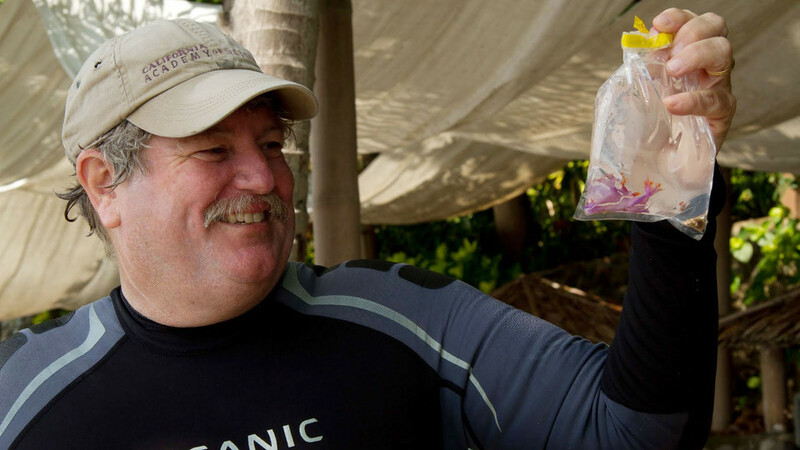 While Duxbury Reef remains a mainstay in Gosliner’s nudibranch research, his career has since taken him all over the world studying biodiversity and conservation policy. 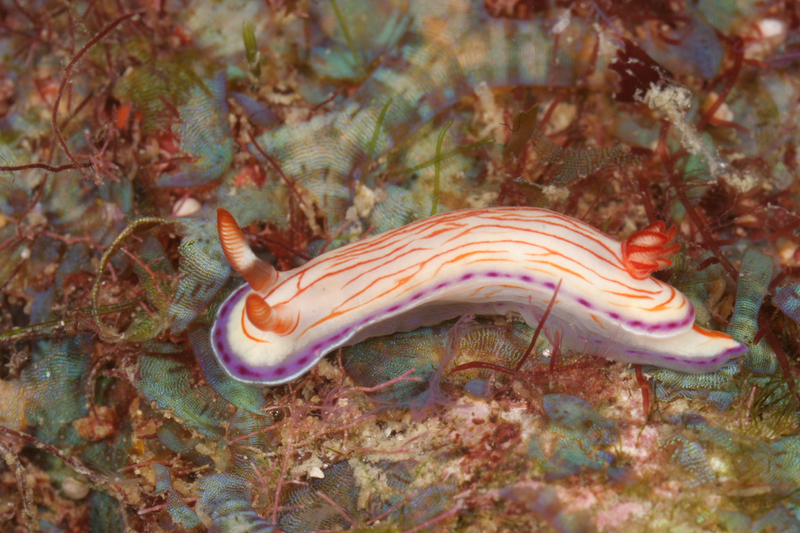 This spring, Gosliner returned from an expedition in Anilao, Philippines, an area so rich in sea slug diversity diving guides have dubbed it the “nudibranch capital of the world.” On his recent trip, Gosliner brought back more than 30 new species to the Cal Academy, among them the 1,000th new species he’s discovered. Gosliner’s mind for memorizing species and their unique forms is renowned. He recognizes them the way most people recognize faces. Valdes named a new species after Gosliner: Goslineria callosa. It’s an unassuming deep-sea nudibranch that lives thousands of meters below its reef-inhabiting cousins. 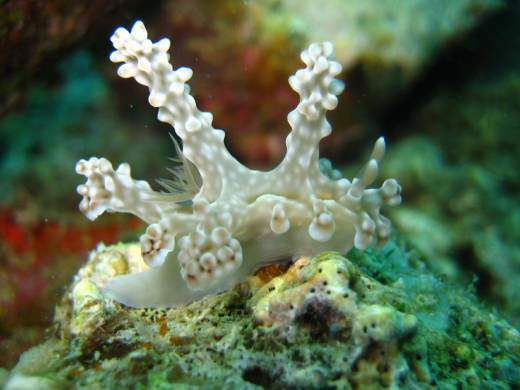 Overall there are some 3,000 nudibranch species officially named in scientific literature, more than 300 of which were discovered by Gosliner. The rest of Gosliner's hundreds of new discoveries await the arduous process of documentation and species description. That first species Gosliner and Williams discovered, Hallaxa chani, they named after their biology teacher at Sir Francis Drake High School, Gordon Chan. Gosliner’s wife and two children have species named after them, too. He names species after inspiring people, like Nelson Mandela (Mandelia mirocornata). He uses local languages and references to their unique color patterns, whether they look like a fried egg (Hoplodoris estrelyado) or a mini orca whale (Philine orca). Gosliner has spent a career mentoring young people like he once was—a high school kid with a passion, who poked his way tirelessly through tide pools, enthusiastically reached out to professionals and carefully documented his work. And while almost a half a century has gone by, some things really haven’t changed. Recently, Gosliner was out in the same Bolinas tide pools that first ignited his life’s passion. And there he came across a particularly spectacular species: one with long, soft protrusions capped in gold lining its back. It was the opalescent, the very first species he ever laid eyes on when his high school professor took him to Duxbury Reef for the first time, greeting him like an old friend.